Lanvin Chelsea boot in nubuck calf leather with tone-on-tone topstitching. Lanvin is the oldest French house of fashion still creating collections. Founded by Jeanne Lanvin as a millinery on Faubourg Saint-Honore in 1889 Paris, the company earned a following among French socialites. Today, the house's tradition of supremely well-made clothes is enhanced by the addition of shoes, handbags, jewelry, and accessories. Balenciaga combat boot with woven lace trim. Stacked heel. Round toe. Lace-up vamp. Pull-tab at back collar. Leather lining. Rubber outsole. Genuine calfskin leather. Made in Italy. Bally Chelsea ankle boot in calf leather. 0.7" heel height. Tapered toe. Elastic side insets. Looped pull at back collar. Bally Chelsea ankle boot in calf leather. 0.7" heel height. Tapered toe. Elastic side insets. Looped pull at back collar. Leather lining. Goodyear welt construction developed exclusively for Bally. Leather sole. Slip-on style. "Scarano" is made in Switzerland. Berluti "Brunico" hiking boot in signature Venezia leather. Round toe. Buckle strap across vamp. Lace-up front with speed lacing. Calfskin leather lining. Goodyear welt construction. Lugged rubber outsole. Made in Italy. 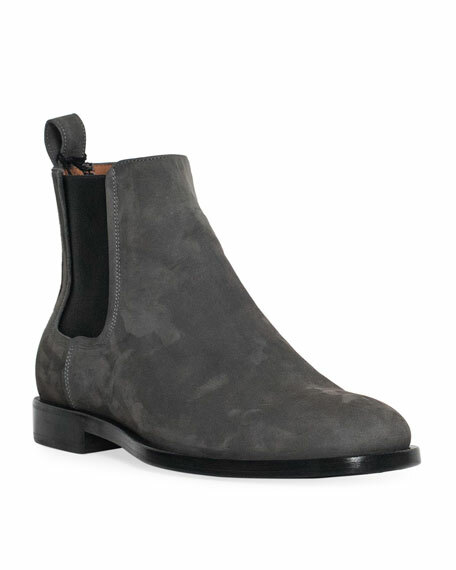 Bottega Veneta Aussie suede Chelsea boot. Approx. 7"H shaft, 10"W circumference. 1" flat heel. Twin-gore slip on style. Looped back tab. Almond toe. Contrast stitching. Rubber outsole. Leather lining and insole. Made in Italy.